Have you considered living outside the walls of your home? We Have. 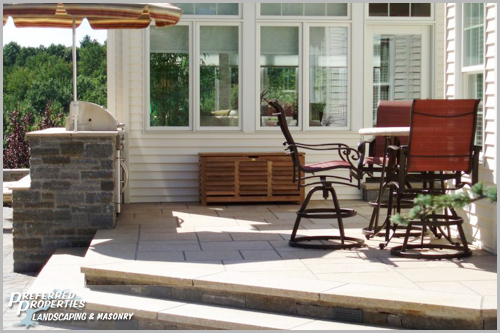 Preferred Properties Landscaping and Masonry are outdoor living and landscaping specialists. 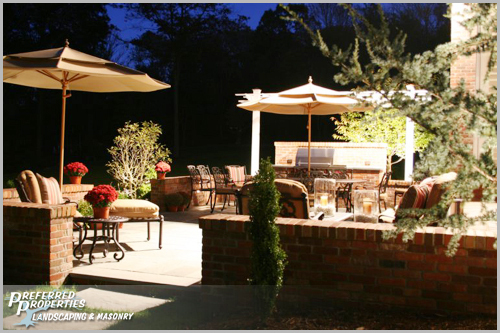 Outdoor Living is an exciting, hot new trend seen in many publications. 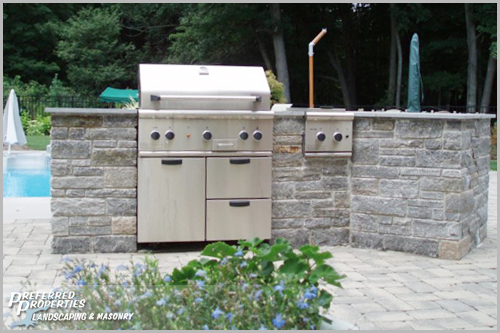 How does one go about designing and building an outdoor Kitchen? 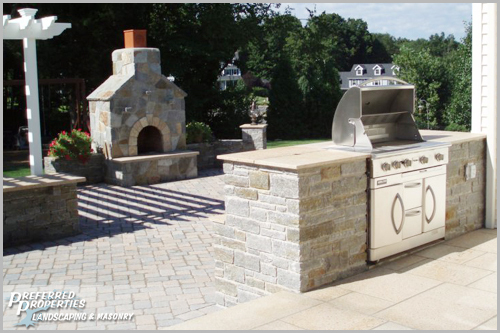 Landscape Living Designer and Specialist Michael Gotowala has the following insight on design ideas and construction methods to follow when building the Outdoor Kitchen of your Dreams. 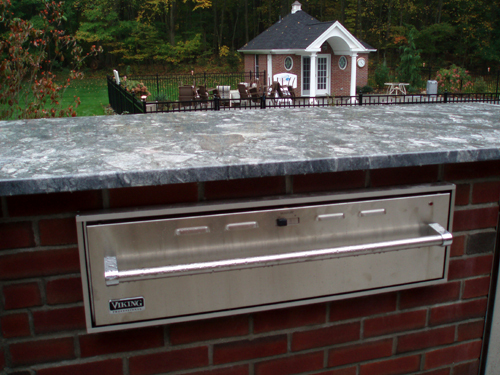 Varied and numerous contractors are required for the design and installation of an outdoor kitchen. 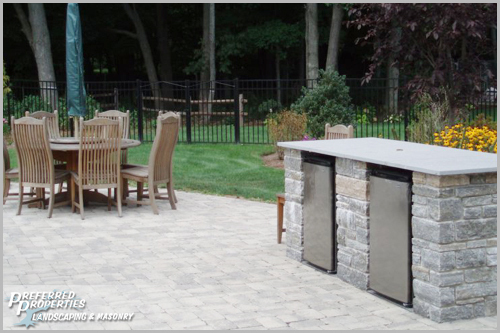 Outdoor kitchens can be as simple as a stand-alone grill or extravagant enough to include an outside dishwasher. Thanks to many publications and television networks such as HGTV, homeowners now have help envisioning what can be accomplished outdoors. 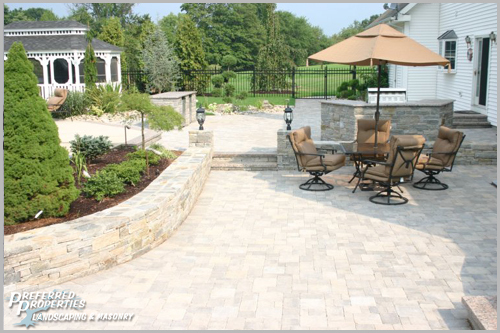 Preferred Properties Landscaping and Masonry's motto has been, “if you have seen it, we can build it”. 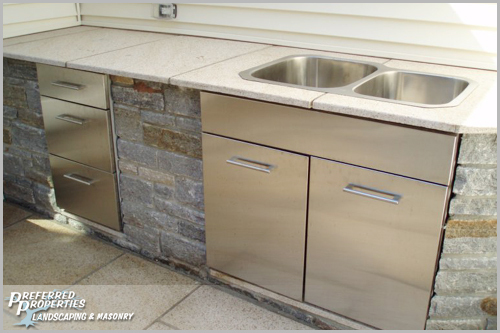 Preferred Properties Landscaping has been involved in some extensive outdoor Kitchens. Preferred Properties Landscaping works along side Chef's of Wallingford, Danver Stainless Steel Cabinetry, Viking, Decar, Weber and others. 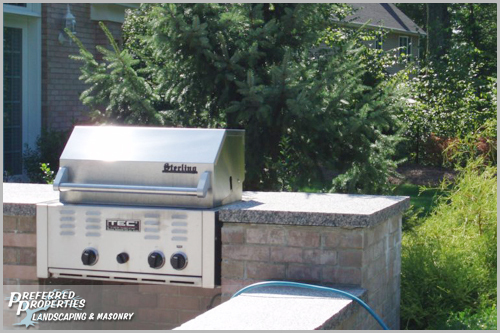 Many choices, styles and levels of quality of appliances and grills exist. 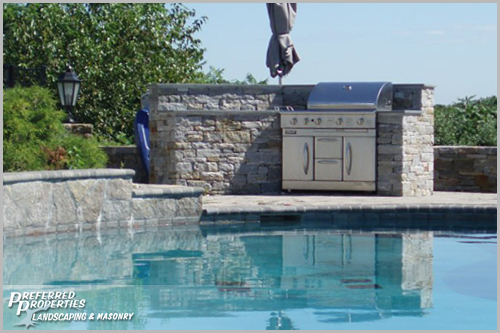 It is best to work with an outdoor kitchen designer who installs so that the functionality of the design is certain to be built similarly. 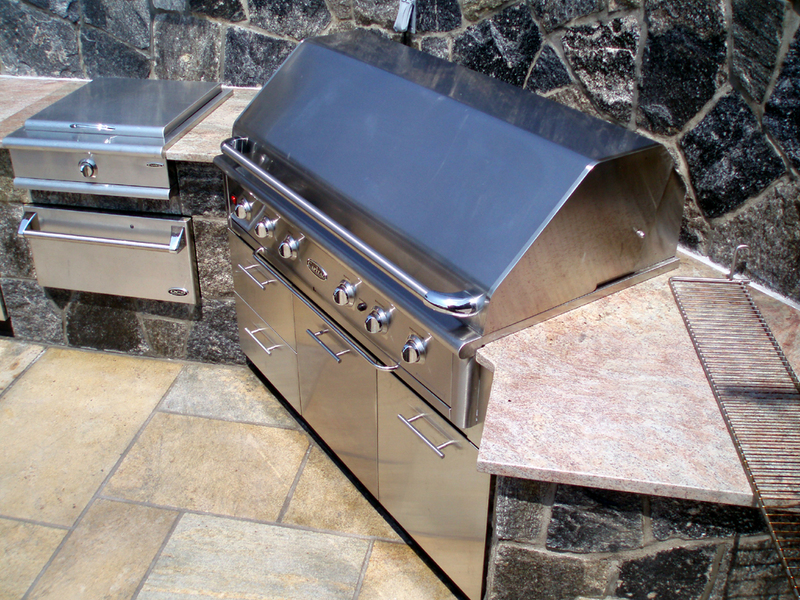 Preferred Properties Landscaping has been building stainless steel grills and appliances for over 10 years, beginning long before this trend became popular. That experience has enabled Preferred Properties Landscaping to expand their design build capabilities accordingly. One must caution the protocol and prioritizing of contractors necessary to build this type of outdoor project. For best results and level of enjoyment, Preferred Properties outdoor living designers ask their customers a series of questions. Questions that concern the physical size of the kitchen layout, types and kinds of appliances to be used, any specialty appliances, type of countertops, flooring options, kitchen to be open faced or covered, and specific details on the outdoor kitchen such as type of fuel (propane, gas or electric requirements). Fireplace, Fire Pit or Pizza Oven? 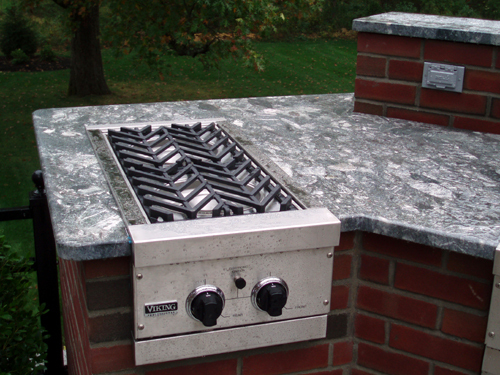 Some questions to consider are the accoutrements of the outdoor kitchen. 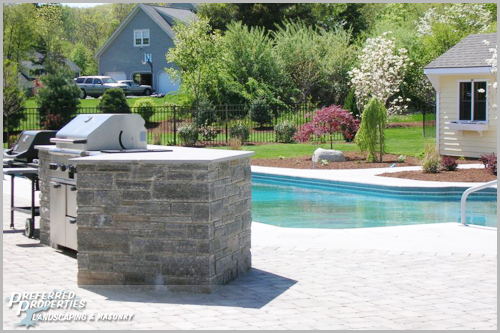 Many times the outdoor kitchen is designed and built around a gathering area, pool area, backyard spa or patio. 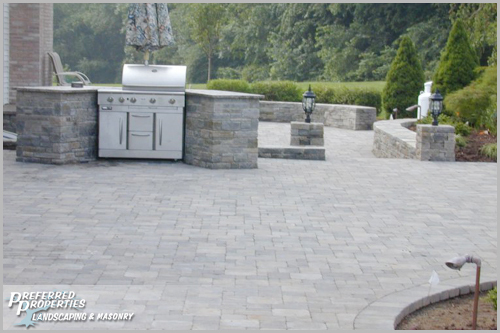 Preferred Properties Landscaping designers have been blessed with award winning masons as well as electrical and plumbing contractors who specialize in outdoor grilling areas. 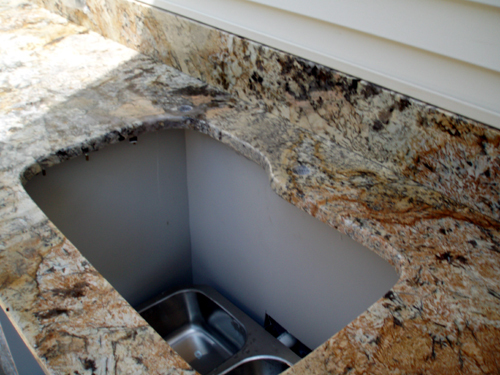 The precision stone setting and granite counter installation is so critical for aesthetics and for weather proof-ness. Stone fireplaces, raised hearths and candleholders built into the chimney are just the tip of the iceberg for a gathering area surrounding your patio. These special touches provide more enjoyment and time spent outback. The outdoor appliance and cabinetry trend has grown. Danver Stainless Steel Cabinetry in Wallingford, Connecticut has experience designing and redesigning outdoor spaces. 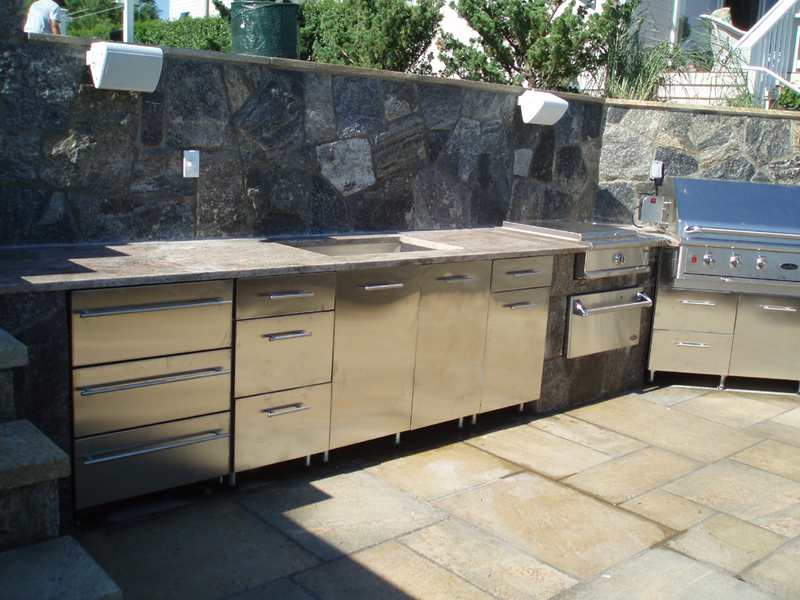 Self-closing, stainless steel cabinetry built to last outdoors is a must. Making your choices for appliances and cabinetry must be a well-educated and informed decision. Cabinet repairs or replacements are costly and sometimes cost prohibitive. Want to go out back and cook a pizza? Unheard of? Not anymore. 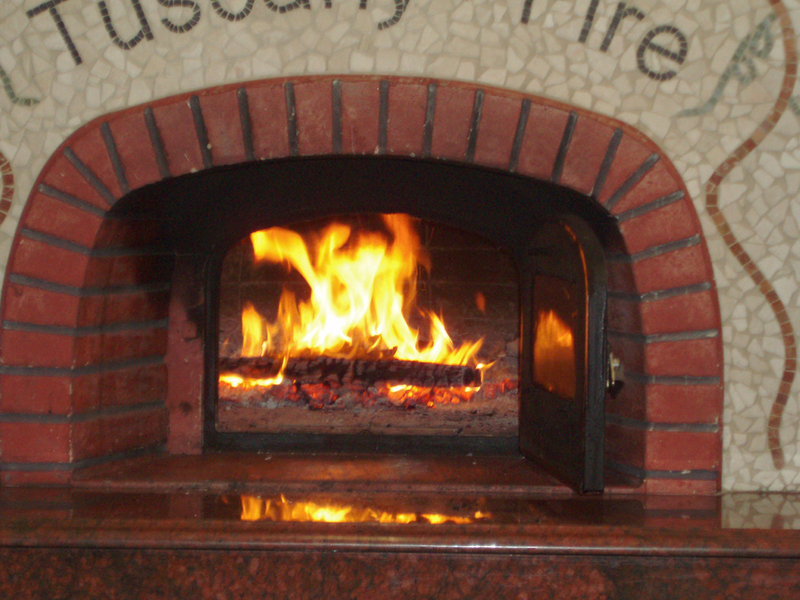 Almost everyone I know has inquired or dreamed about having their own pizza oven, fire pit or both for that matter. 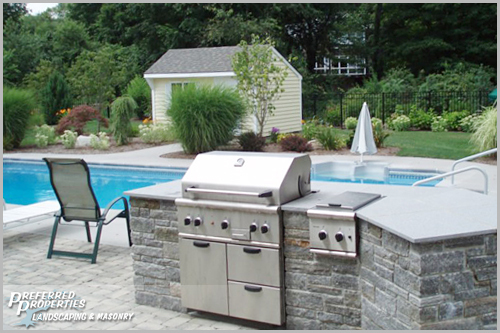 The investment and value derived from a professionally designed and built outdoor kitchen is better than an expensive car. The enjoyment is tremendous and the area in which you may build this kitchen is already your space. This is just a better way to enjoy that outdoor space. What Can You Do Outside Besides Grill? The possibilities are endless. Fire, water and cooking mixed together to create the space of a lifetime. Put this all together and build it in stone, granite marble and limestone. WOW, WOW, WOW! We invite you to schedule a free consultation with a Preferred Properties Outdoor living and landscape designer to see for yourselves. 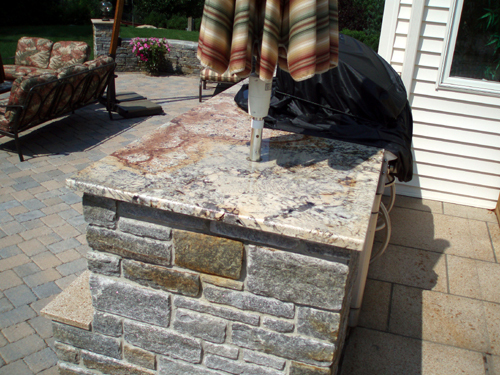 I personally have built stone barbeque grill areas for couples that don't do a lot of outside grilling and yet use their convertible car covers to protect their precious outdoor kitchen investment. Built over time and enjoyed throughout, an outdoor living area is quite the space to have. 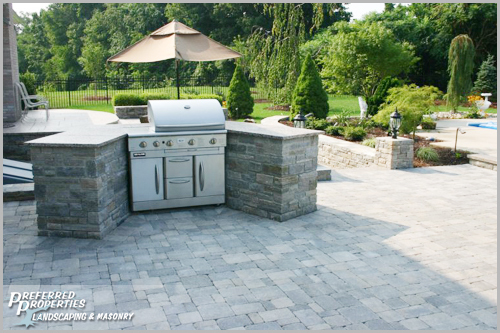 Once your outdoor kitchen is in the design process, don't forget to add music, video and heat. These outdoor living areas should consider the fall chill, summer bugs and rainy days of New England. 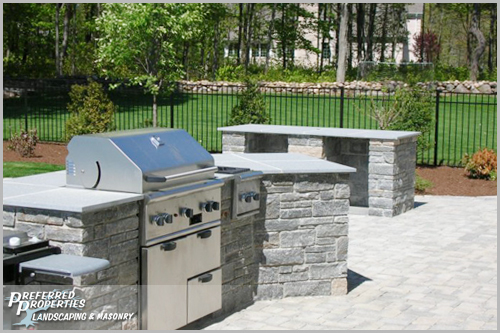 With this taken into account, a comfortable, functional and exceptional outdoor kitchen experience can be had. 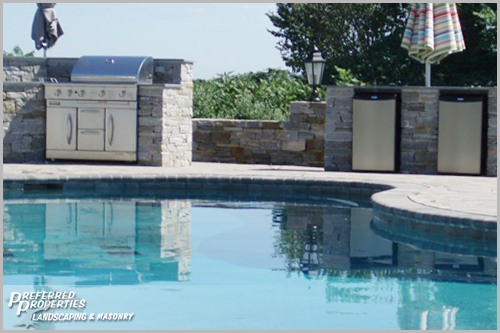 Preferred Properties Landscaping likes to design with at least 2 refrigerators, one for the kids to enter in and out for drinks, and a more sophisticated refrigerator to store meats, accoutrements and prepared dishes. Grills with side burners, rotisseries, and warming drawers are all common. 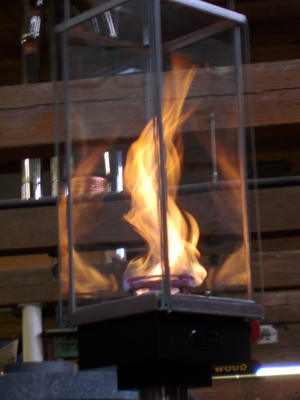 Top burners, wok burners and lobster pot burners up to 65,000 BTU's are now available. Cabinets for underneath the grill, along side the warming drawers and accompanying the burners are also available with lots of accessory choices. Sinks for preparation and washing are available. All these can be designed to stand alone or be connected with stone setting. 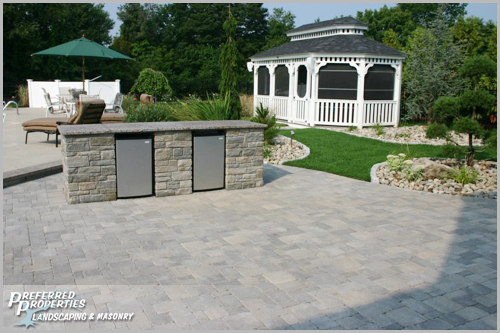 Stone, granite, limestone, brick, re-fab stone, and paver stones are all types of masonry choices to consider. 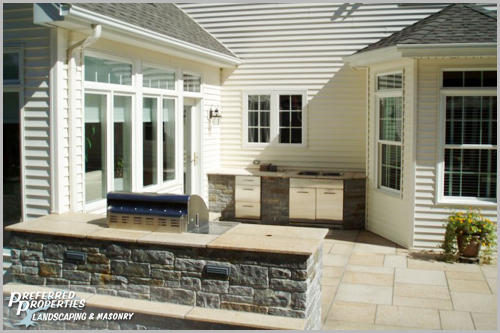 We consider the architecture, color of the house, patio and any existing masonry to find for the right look. 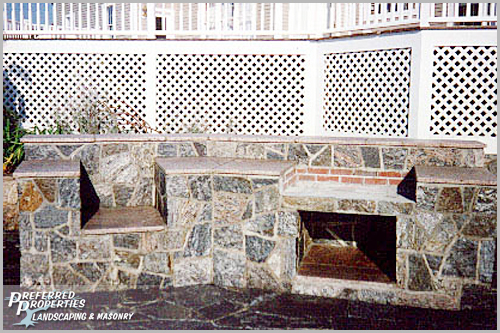 Preferred Properties Landscaping has assembled many granite surrounds off cooking areas, fireplace hearths, spa surrounds and patio sitting walls. 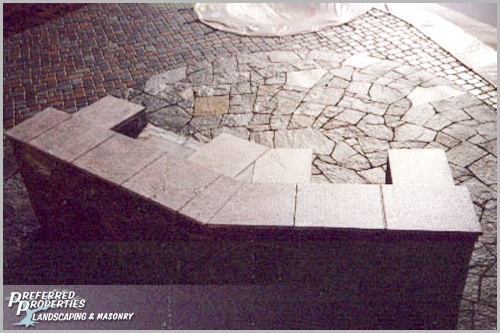 These only last when prepared with the correct masonry procedures. 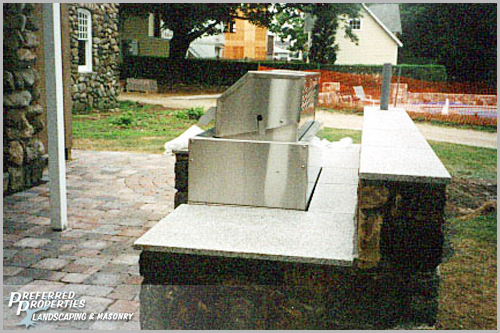 Lots of masons are not competent outdoor kitchen builders. Sure they can do it, but why have them do it when you can hire Preferred’s experienced professionals the first time. Preferred schedules and contracts other contractors to assist with plumbing, electrical, gas line installation and granite countertop fabrication in mind. 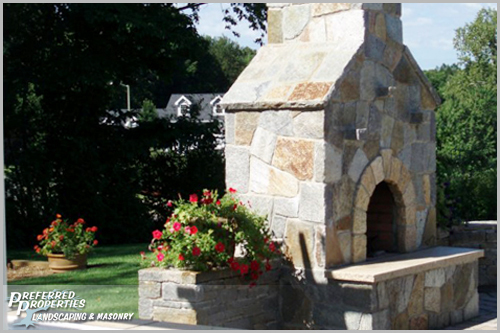 Would you hire only a mason to build an outdoor kitchen? Of course not, but you absolutely need a good mason. However, you also need a designer, installer, an electrician who knows the appliances and electrical requirements. The same experience and coordination are needed for plumbing and gas connections to run these units efficiently. All said and done, you need competent contractors skilled in working outside in stone. 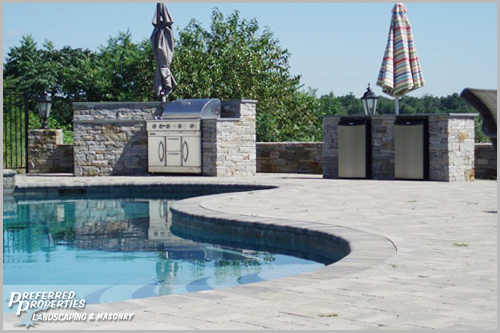 Outdoor kitchen and living space could be the largest investment one could make outdoors, comparable to pool building costs. You need a competent, trustworthy and experienced individual or firm to make things run smoothly and prevent costly overlaps, time delays and excessive purchases. 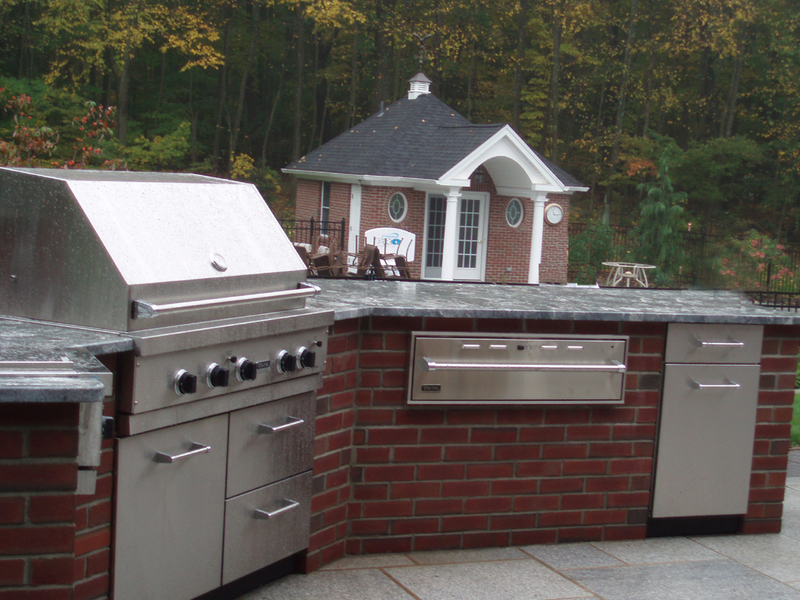 At Preferred Properties Landscaping we take pride in our work and build only a few outdoor kitchens at a time depending upon the extent of work and time of the season. Planning ahead is essential as there is a lot to do. 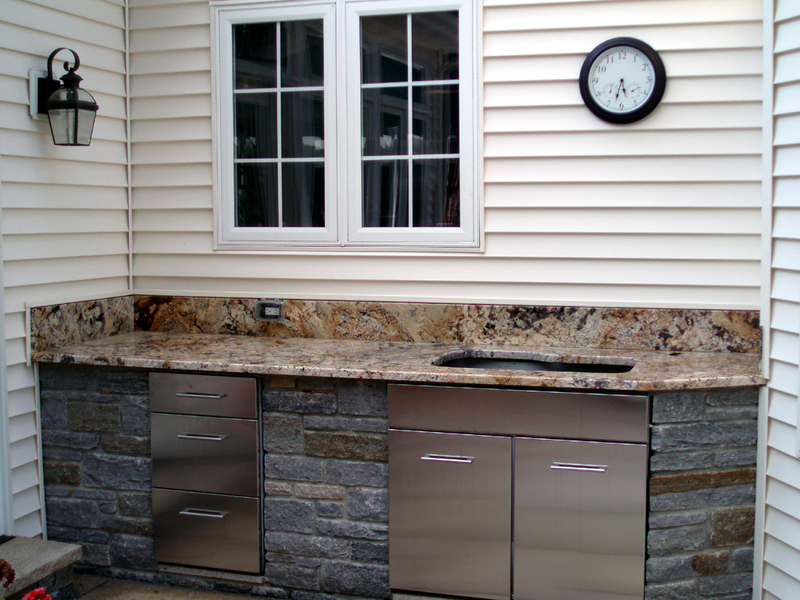 Designing and building an outdoor kitchen can sometimes exceed 3 months depending on permits and approval process. Covering Your Kitchen Is It Worth It? Yes indeed. 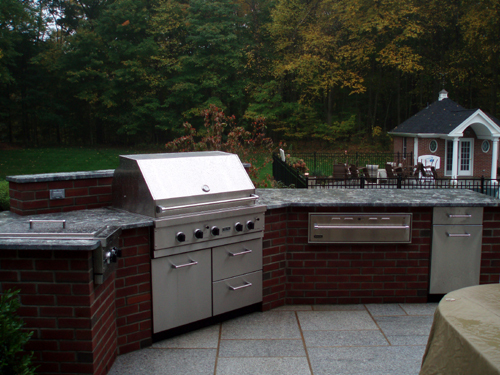 Imagine all the money you spend on an outdoor kitchen and not using it in the winter or when it rains. 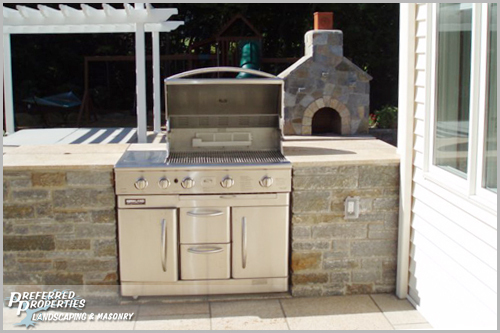 Covering your outdoor kitchen area (or partially covering it) extends the use twofold. Not only does the investment purchase stay covered and protected, but it also protects the overhead surfaces, kitchen and people in it from the elements. The covered roof whether it is slant, post and beam, tied into the existing roofline, or a simple pergola is a great touch. Best of all, a roof can accommodate ceiling fans, speakers, conceal night lighting fixtures and offer shade. Go with a competent builder, one who knows footings and rooflines. Use pre-fab stone, pillars and stucco for that extra punch. Leave ample overhead space so rainwater does not run over the edge onto family and guests. How do you get start the design process? What do you want to do outside, and what do you want to accomplish? What type of cooking or food preparation do you intend to do? These are just a few sample questions to get you "warmed up". Everyone has kitchen experience, if not cooking, surely cleaning up and doing the dishes. The experience one has, primarily mainly the cook or other interested party in the family can help you. The layout and stone work surrounding the appliances depend on what types of and how many appliances you intend on bringing to the table. This begins to draw scope to the size of the area in which your outdoor kitchen will be built. When considering the area to build, one must know if it freestanding or up against existing house structure. These considerations may limit access to plumbing, water and electricity. Proper design techniques and planning are essential as well as consulting building and zoning departments. Magazine pictures are not always acceptable under local building codes. Photos may look pretty but not be legal in your town. Planning and permits are the responsibility of the homeowner. Preferred Properties Landscaping has the ability to design, coordinate, build and ensure your satisfaction. How so? 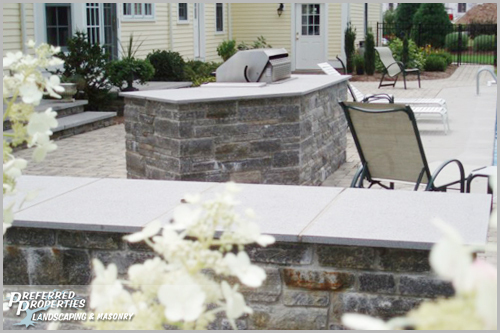 Because Preferred Properties Landscaping are outdoor living and masonry specialists. This is our specialty. Please take a look at our portfolio below.